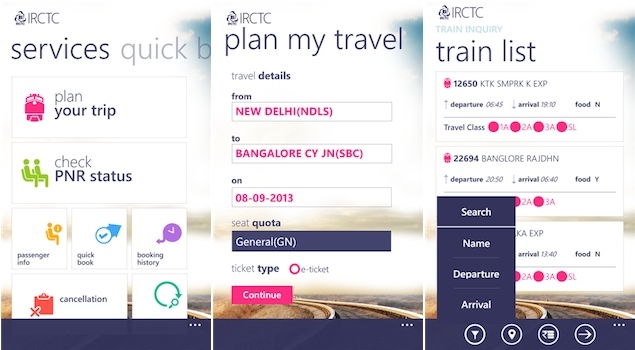 Microsoft and IRCTC (Indian Railway Catering and Tourism Corporation) have come together to launch an application for IRCTC, which will help users to book train tickets as well as get other Indian Railways related information. The app comes with Windows Phone’s Modern UI design philosophy, Featuring a smooth, fluid interface with multiple screens and various tile based icons which makes it more intuitive and easy to use. However, you need to sign-up for IRCTC’s service and generate a TPIN to log in to the account to access its features without having to enter details like phone number and other basic details repeatedly while booking through the IRCTC app. You can also check PNR status, cancel tickets, check train status and booking history, look for options of trains, filter items on the basis of train name or destination information, also check the routes of respective train on a map supported in the app itself, make booking based transactions, take care of other payments, and do a lot more. The IRCTC app also allows users to pin a ticket on their homescreen, which can be used to check the PNR status and other information without having to open the main app. It will require constant data connection to work and provide information in real time. The app will not work from 8AM to 12 noon,when access to the service is blocked for agents and for mobile devices to reduce load on servers during Tatkal ticket booking window and from 11:30PM till 12 midnight will be closed for maintenance. The app will work on the Windows 8 and Windows Phone platforms. The IRCTC apps can be downloaded from Windows Phone Store,Windows 8 PC and are free of charge.